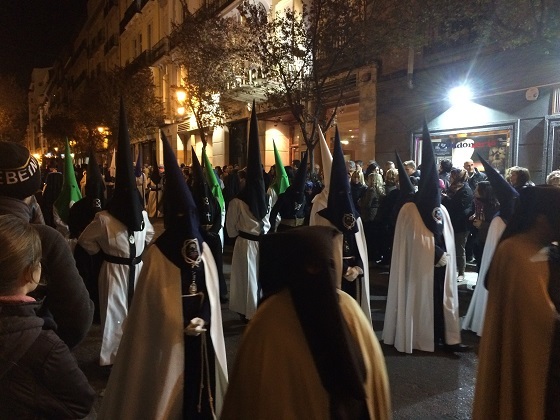 Apparently Holy Week or Santa Semana in Zaragoza is not in the same league as Andalucia – well that’s what I read, but we found it to be pretty incredible. So scenic with several processions going around and through the narrow city streets every evening, we were amazed by the dramatic sculptures and icons, fascinated by the women clad in black and as for the hundreds and hundreds of hooded people playing drums – magnificent. 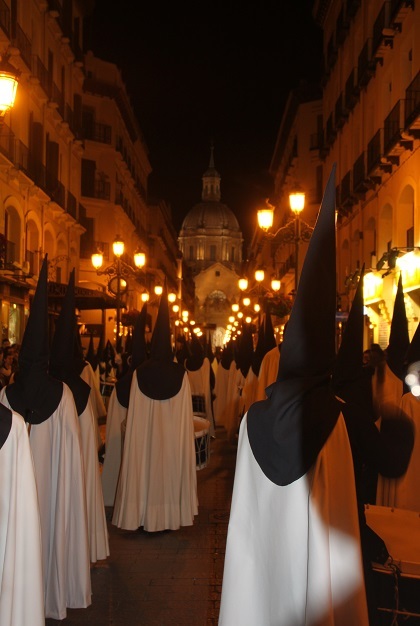 The Holy Week celebrations in this city date back to the 18th century and apparently the celebration attracts more than 100,000 visitors each year. We found the streets lined with people but did not hear another English voice the whole time we were there. Our visit was definitely enhanced by having the opportunity to view the processions on several occasions with our wonderful Spanish friends – a family whose excitement was contagious, they explained all the traditions carefully to us and made us feel completely involved. 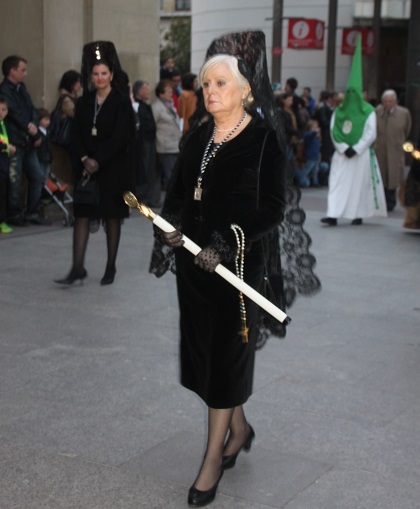 More than 15,000 people take part in the processions. They are members of 24 Easter brotherhoods who spend much time (and probably a lot of money) preparing and practising for their procession. They wear tall pointed hoods and robes, each brotherhood has a different colour and a slightly different outfit. Son was a bit taken aback (we all were to be honest) when we saw the first procession. These costumes, having never seen them before, reminded us all of a more sinister organisation and we found them a bit off putting. By the end of the week though we had got used to it all and didn’t flinch. The brotherhoods are religious associations that look after the icons throughout the year and plan the next events and celebrations. 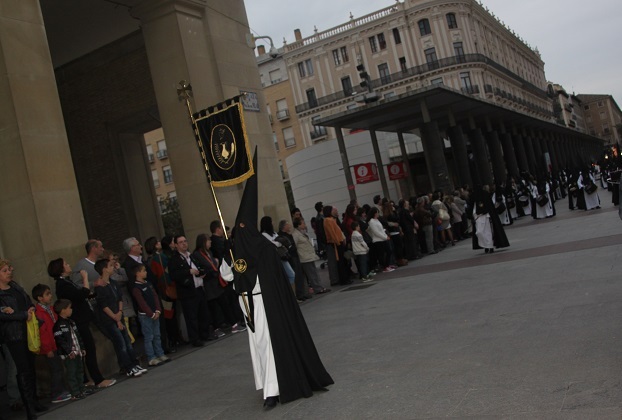 They are the heart of Holy Week in Zaragoza and were formed in the 16th century for this purpose. They abide by strict regulations to ensure this is a true Roman Catholic event and do not include pagan traditions in their events. We met one of Husband’s colleagues who is a member of a brotherhood and saw how these people take this role very seriously. The outfits put us off guard but so did the icons – not being Roman Catholic these were also something different for us. 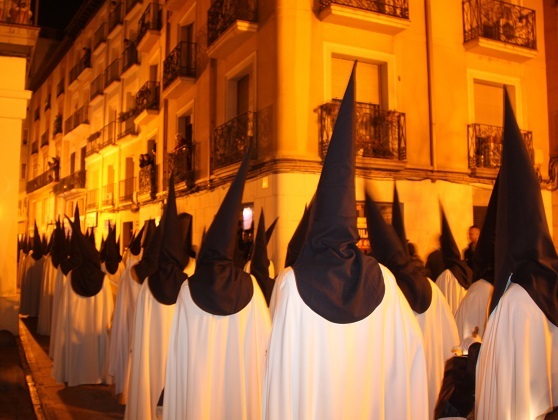 The outfits have no sinister meaning – the cone shaped hat symbolises rising to the heavens. The brotherhoods hide their faces and leave holes for their eyes, this is supposed to represent them mourning the death of Jesus on the cross. Apparently the hats are removed on Easter Sunday. Traditionally all these hooded people were male, in recent years more women have become involved and now lots take part. The drumming and trumpet playing symbolises marching around the Walls of Jericho. The whole thing starts on the Saturday before Palm Sunday with an opening ceremony and procession then daily processions of the different brotherhoods follow. 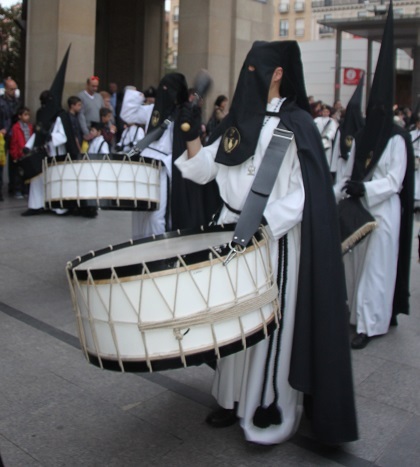 We arrived on Palm Sunday in the evening and just followed the sound of drums beating to see our first procession. This became a feature of our evening the whole time we were in Zaragoza. 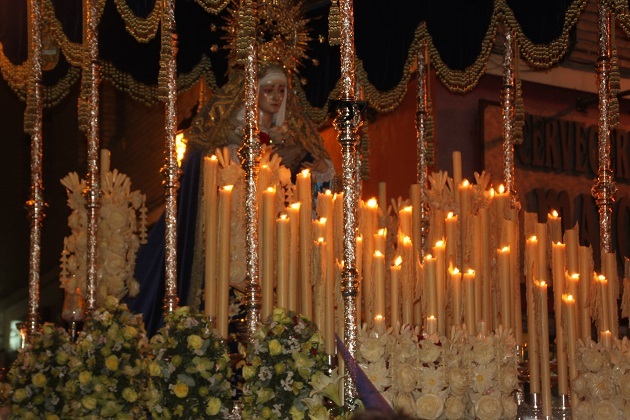 Some processions go on until 3am – we never made it to the end of one. The symbolism is all very serious but the city was still vibrant and busy. As well as the brotherhoods we saw women wearing traditional black outfits and mantillas, so many drummers and groups of men carrying floats adorned with flowers, candles and the icon. They marched slowly and solemnly down the old streets of the city to the rhythm of the drums. They stop occasionally for a prayer or silent meditation. There is always an intense smell of incense in the air. We found the whole experience to be engaging and rather emotional. What a fascinating tradition! That must have been amazing to see in person. It was incredible, words don’t do it justice really, it was a real spectacle with a special atmosphere. Lovely post. The Seville procession sounds wonderful but very crowded so I think you chose a good one. I went for an even smaller affair in Siguenza, about 80 miles west of Zaragoza and that was an unforgettable experience. I have a suspicion that the SS in the cities of Extremadura would also be worth a viewing. Thanks for the memory nudge! 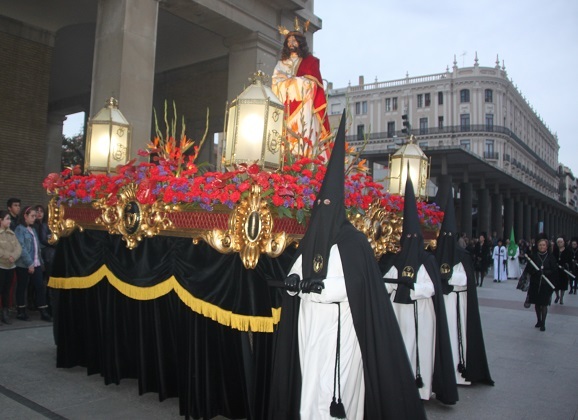 Just googled both Siguenza and Extremadura – both processions look incredible too. We would definitely go back to Spain to see this again so great to have a couple of other options now – thanks Andrew! Looks like an incredible procession, what an experience to have! It was something very special the like of which we had never seen before – definitely something to remember! Such an interesting post. 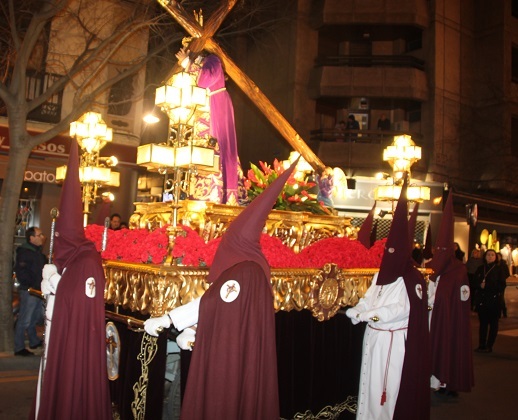 We were in Seville the week before Easter two years ago and saw the procession each night then. The narrow streets of Seville were very crowded and, being small, I didn’t always get a good view but as you say it’s so atmospheric to be part of it. I’m pleased you were able to see it for yourselves and so nice to be for you to spend time with a Spanish family. Someone else mentioned the processions being crowded in Seville, we didn’t have that experience at all here, no matter where we seemed to be in the city at whatever time we always got a great front row view. It is an incredible thing to experience and we did feel very lucky to be with a Spanish family – that just made it all extra special. Great post!!!!!! It’s so nice to see my country’s traditions through the eyes of an outsider with so much respect and going beyond the cone shapped hoods….. :)!! Love the photographs too! Thank you – we felt very privileged to be able to see this incredible procession and find out what everything meant – it was unforgettable. The pageantry looks amazing but those black hoods really, really give me the creeps! I totally get that – I felt the same way to be honest at the beginning. What a great opportunity to witness this. Looks very impressive! It was Erika – an incredible spectacle. Thank you for sharing and making us part of that experience! We found them really creepy as well at the beginning Suzanne, the same reminder for us!! Joy, I found this to be extremely interesting! But, I do admit being from the South of the US, the hoods were off-putting to me! Thanks for sharing about their traditions! It was great to have friends explain the meaning of the celebration! The hoods and costumes definitely had a similar effect on us Pam at the beginning, we didn’t quite know what to make of it all. However our lovely Spanish friends explained everything and the meaning of all the outfits etc. which definitely helped. Wow – so striking. We are Roman Catholic, but the emotional impact of the pointed hoods/masks still creates so much inner conflict… My favourites are the little boy with the drum and the woman with the lace mantilla -so stately. Thanks for sharing! 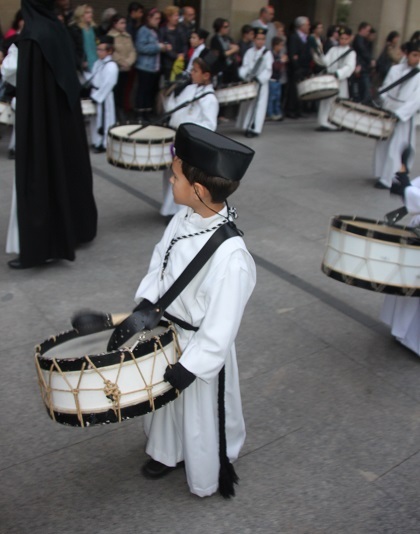 That little boy was so cute – he had such stamina as well, beating his drum and marching for hours. The hoods were definitely different for us, we felt more than a bit apprehensive at the beginning however talking to the people there and understanding the traditions and what they really meant definitely helped. I think that is the greatest gift of travelling – talking to people and building understanding about how they live… It’s eye opening in so many ways! What an unusual thing to witness, fascinating but yes their wardrobe has been slightly hijacked by another organisation. That’s a bit of an understatement really. Know exactly what you mean – that was the first thing we thought of when we saw our first procession…. Fascinating post. I wonder if the “more sinister organization” copied their costumes from this tradition? We’ll be in Spain in 2 weeks so your post was timely, too. We’ll be in Andalucia, but my knowledge of the country is woefully weak so any information is welcome. I don’t know if they copied or not but the similarities are too strong for that not to be the case? We spent a wonderful holiday in Andalucia before our son was born – 13 years ago now so memories are a bit distant!! I do remember loving all the little white hill towns, the more obscure the better also Ronda was a highlight and of course the Alhambra in Granada. Thinking about it makes me want to return…. Looking forward to reading about your trip now. very interesting! and it looks a bit scary with black hoods. We thought so too but when you hear the meaning of everything it makes a bit more sense and becomes less frightening. What a neat experience! Your low light images look fantastic too! Good work there. Don’t short change your skills! They came out well! Fascinating! I have never heard of this celebration/tradition, but now I want to attend. Your pictures turned out wonderful. Thanks Melissa, it is a unique and unusual thing to witness, we were blown away!! Lovely pictures! We discovered this tradition quite by accident in the streets of Malaga last year. It’s very impressive. It is like nothing else I’ve ever seen before – what a thing to find by accident too – it must have been quite a surprise to come upon all those men in the hoods!! Great photos! The scene looks so haunting with all of the black. It is completely mesmerizing and such a unique thing to see. Thanks Christie, it was an incredible spectacle to see. Wow. What amazing parades! It reminds me a little of some of the festivals we see here in Japan, with vast groups of the devout wearing traditional garb marching through the streets. Always fascinating to observe as an outsider. It was so amazing for us Susan, like you say being an outsider and never having seen anything like this before was incredible. The Japanese festivals sound like amazing spectacles too. 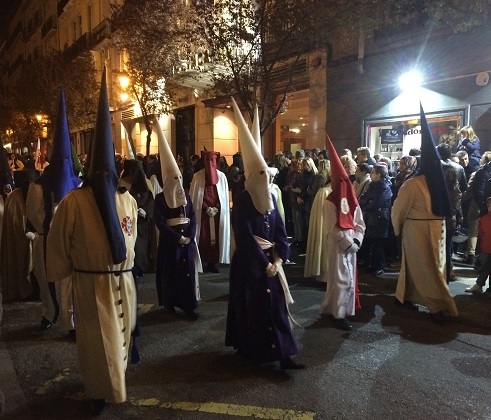 You have to remember these processions pre-date the KKK, so it really isn’t that sinister. I saw it in Grenada one year; it was ridiculously crowded. Great pictures! Absolutely but unfortunately the more sinister organisation seems to be the one that springs to mind first of all!! It was busy in Zaragoza but not at all crowded, think we lucked out with that. It is so nice to be able to see those masks in a new way, and to understand a bit of the background as to why they are designed like that. Thank you! How special to be able to witness such an important cultural tradition during your visit. It was such an incredible spectacle and so wonderful to watch – not at all sinister when we understood the meanings of everything! I wish we could all have such a re-conditioning process. Fascinating! This is amazing! I admit my first reaction to your photos of the pointed hoods was not a positive one but the whole thing is fascinating. All the symbolism and the tradition is really interesting. Thanks for sharing. Someone else pointed out to me that the traditions here have been going on way before the more sinister organisation so they had the hoods first. I do admit though that when we saw them the first evening I felt more than a bit unsettled. The processions are incredible though when you get used to them! This was incredible George, a bit disconcerting to begin with, those hoods… well sinister things first popped into our minds but when we realised what everything symbolised that went. It was just such a wonderful thing to witness – spine tingling. Yes, the hoods gave me a bit of a shock at first but after reading more understood. Very different stuff. Quite the experience. 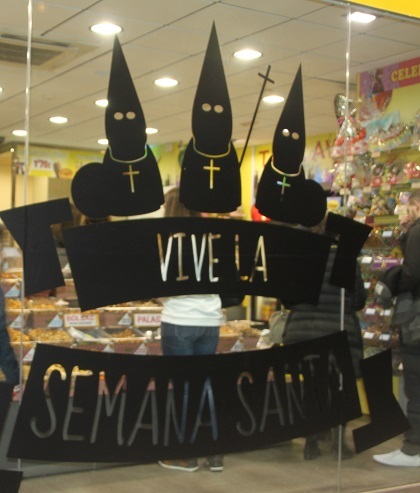 Easter week in Spain is, indeed, very interesting. 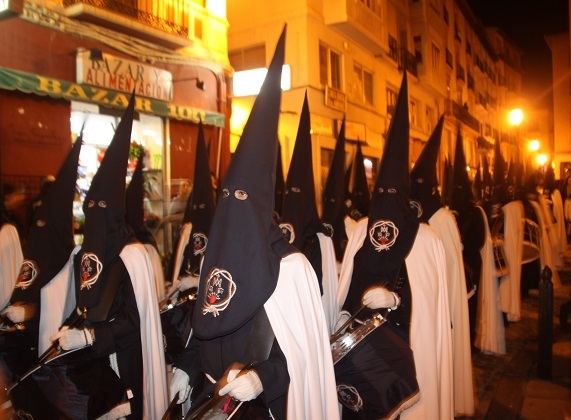 Once we were in Avila at the time of these processions; the masked brotherhoods spooked my eldest kid so much that he refused (I mean REFUSED) to go to sleep (I think he was 4 or 5 at the time). We actually ended up packing our stuff and leaving our hotel at 4am, all in an effort to calm him down… Ah, the fun of travel with kids! ;o) Great articles! I can totally see why he was freaked out though – I have to say when I saw the processions the first time it made me a little uneasy and I knew what to expect!! A spectacle though and one it is truly amazing to see.